I have lost track of the number of books I have reviewed. I was reviewing books long before I started Eternal Haunted Summer. This is the first and only time, however, that I have been asked by an author to review her book specifically to combat negative and inaccurate reviews. That confused me, and I am still confused. Why would anyone deliberately write an inaccurate, negative review? Are there really people within the larger Pagan community who are that petty? Or was it just laziness on the part of the reviewer? Whatever the reasons, when Krasskova asked me to look over A Child’s Eye View of Heathenry, I was happy to do so. I may identify as Hellenistai, but I find the Northern Traditions to be fascinating, and Krasskova’s Runes: Theory and Practice is my favorite book on the topic. Additionally, I love kid’s books. 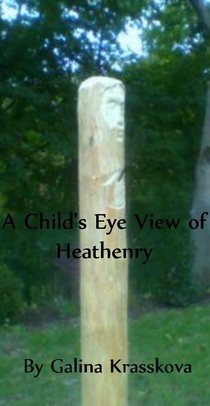 Available in various ebook formats, A Child’s Eye View of Heathenry only runs about twenty-five pages (depending on font size, screen size, et cetera). It’s a quick read, and not difficult. It is definitely geared towards the seven-to-thirteen age range. And it is exactly what it bills itself to be: a basic introduction to the tenets and practices of Heathenry for children. The first chapter focuses on the historical origins of Heathenry, and defines such basic terms as polytheism, vaettir, reconstruction, and so forth. The second chapter looks at the “Holy Powers,” identifying and describing some of the Aesir (Odin, Frigga, Eir, et cetera); Vanir (Freya, Freyr, Nerthus, et cetera), Jotnar (Mani, Sunna, Loki, Sigyn, et cetera); and miscellaneous Powers such as Weyland Smith, Andvari, The Nornir, and so forth. The discussion of The Nornir also includes a lengthy (though not difficult) explanation of wyrd, and how and why it is so important to live honorably. There are also subsections on honoring the ancestors and the vaettir. Finally, the third chapter discusses “What You’re Supposed to Do.” Establish a right relationship with the Holy Powers. Set up an altar. Pray. The book concludes with a series of thoughtful questions and suggested reading. Is Krasskova forceful in her opinions? Yes. But no where in the book does she state that hers is the only way to be Heathen. Quite the opposite: the text is full of suggestions, ideas for how to live one’s Heathenry, not commandments on how it must be lived. So, if you are a parent or guardian looking for a kid’s book on Heathenry, check out A Child’s Eye View for yourself. If you approve, pass it on to the child in question. If not, find another text more in line with your philosophy. Or, write one yourself. The world needs more good books for children on Paganism and Heathenry. Recommended to fans of Altars Made Easy by Peg Streep, Essential Asatru: Walking the Path of Norse Paganism by Diana L Paxson, and d’Aulaire’s Book of Norse Myths.